·The composition of the current Summer Festival venue can be changed later, so please make sure to reconfirm the notice before visiting the venue on the Summer Festival day. (10:00 ~ 20:00) Where is the ice? 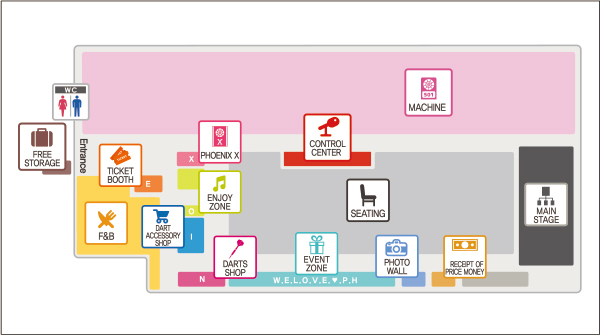 ·You can visit the participation event zone alphabetically or you can receive stamps after participating in each event. ·On Friday, depending on the progress of the tournament the event time maybe altered. ·Event contents or rewards maybe altered or cancelled without prior notice. Successfully completing an event will earn your a sticker → At the event booth after checking the stickers, it is entered for a draw → By selecting the alphabet from W.E.L.O.V.E, there is stamp related to each text. After spinning yourself around 5 times, throw 3 darts and achieve over 80pts. After putting on the Cone hat over your face you must throw 3 darts to achieve over 50pts. Wins over 80 points by throwing a dart three times on the foot holds of the choosen colors after drawing two wooded sticks! Three players compete in the game of 301, who ever finishes first wins. Play this game with a child or a foreigner, taking turn using each leg the team must achieve the required points. Those that enter the tournament hall first will get the “WE ♥ PHOENIX” tattoo and once they bring it to the event zone they will get a stamp(♥). Only once a year, only at summer festival you are allowed to Challenge the global champions, get the stamp (P)! get the stamp (O) ! A true Darter cannot miss this place ~ Get the stamp (N)! Only chance to see the unveiling of the next generation machine "PHOENIX X"
Get the stamp (X) after seeing the machine! 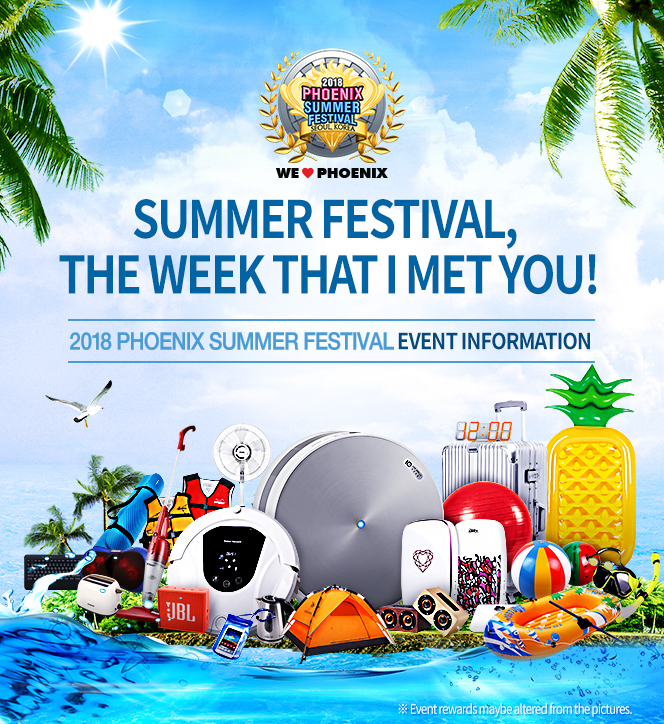 ·After try once (per 1 person), upload a photo(Hash tag required #PHOENIXDART, #SUMMER FASTIVAL) to Facebook and get a stamp (X)! ·Write down the points you felt after the VSX experience and put in a draw box! Enjoy various recreations with professional MC on set after pre-reception! The organizer of the 2018 Summer Festival holds the right to change or modify the rules, regulations, and details without notice. Please check for the updates from www.phoenixdart.com frequently. 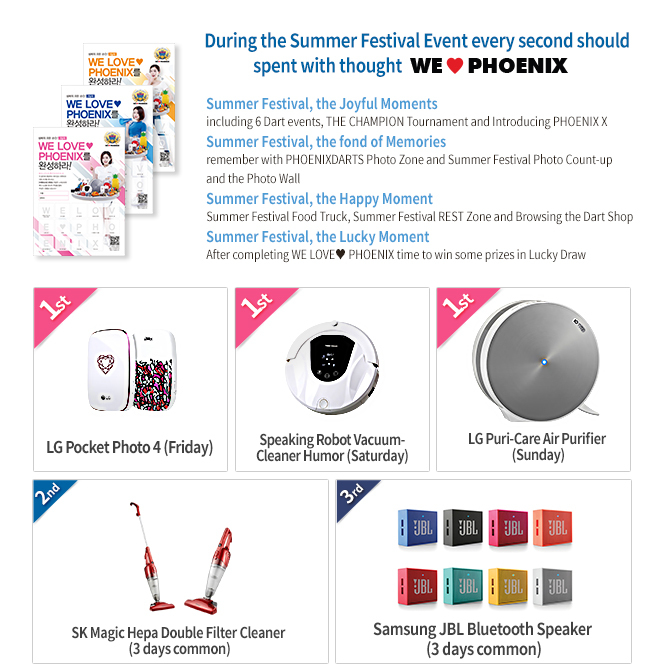 2018 PHOENIX SUMMER FESTIVAL organized by Korea Darts Association. Copyright © Korea Darts Association. All rights reserved.